There are many considerations when buying a diamond. The diamond industry uses a variety of characteristics when grading and categorizing a diamond. When choosing a diamond it is important to understand the 4C’s, Cut, Color, Clarity, and Caret. Spending a little time learning these will make your diamond buying experience much more pleasurable experience. It’s the diamond’s cut that is responsible for it’s sparkle and brilliance. A cut that is either too deep or too shallow will fail to reflect light back to the eye and as a consequence the diamond will loose it’s fire and brilliance. The cut is considered the most important of the 4C’s. Diamonds graded by the AGS are graded with the following verbal descriptions: AGS Ideal, Excellent, Very Good, Good, Fair, and Poor. In terms of color, the most valuable diamonds are the ones that approach colorlessness. The less color in the stone the higher its value (with the exception of the fancy stones, such as pinks, blues, and browns). Diamonds are natural materials formed deep in the earth under tremendous pressure and heat. All but the rarest diamonds have natural internal inclusions or external (blemishes) that affect the clarity of the stone. A diamond with fewer inclusions is said to have greater clarity. The AGS follows a 10 point scale when grading a diamond for clarity with 0 being a flawless through 10 which would indicate that a diamonds has inclusions visible to the human eye without magnification. Flawless and Internally Flawless diamonds contain no internal inclusions when examined by a skilled grader under 10x magnification and in a proper gemological environment. 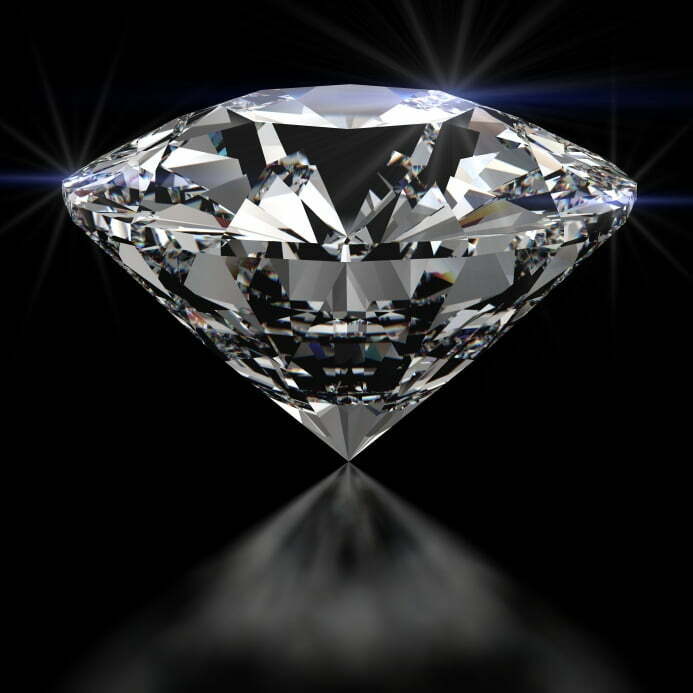 An Internally Flawless diamond may have minor blemishes (marks and features confined to the surface only). Slightly Included diamonds with a clarity grade of 5 or 6 (SI1 or SI2) have noticeable inclusions that are fairly easy to see under 10x magnification. Sometimes, these inclusions can be visible to the unaided eye. Included diamonds with a clarity grade of 7, 8, 9, or 10 (I1, I2, or I3), have inclusions that are obvious at 10x magnification. Inclusions can also be obvious to the unaided eye, and at the lower clarities, may have an effect on the diamond’s durability. The carat is the unit of measurement for the physical weight of diamonds. One carat equals 0.200 grams or 1/5 gram and is subdivided into 100 points. A one carat diamond weight about the same as a paperclip. Because larger diamonds are rarer a diamond of 1 carat will cost more than twice as much as a diamond weighing .5 carat (color, cut and clarity being equal). Because the other 3 C’s of diamond quality are such an important factor a smaller carat stone sitting next to a lower quality larger stone make appear to look larger because of it’s brilliance, color, and clarity. Its important to have a gemologist on hand to explain the subtle differences.